Okay, I have to admit something to you. I’m . . . not so into eggplant. I know, I know. Bad foodie! Bad veg*n! I’m not proud. But every so often I’ll get one in a dollar bag or something. And when that happens I’ll make that eggplant do the one thing I like eggplants to do : baba ganoush. Mmmm, with a name like that, how could you *not* love it? Eggplant season in the northern hemisphere is July thru October, depending on your location. So get ready! This makes the perfect summer dip. Wash the eggplant and prick the skin with a fork (don’t forget this or eggplant go boom!). 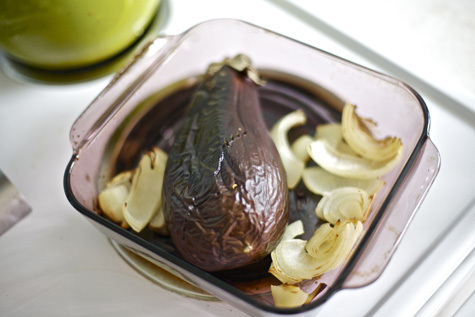 Place the eggplant in a lightly oiled baking dish. Rough chop the onion and add the pieces to the dish. Roast for 30-40 minutes, until the eggplant is very tender but before the onions burn. 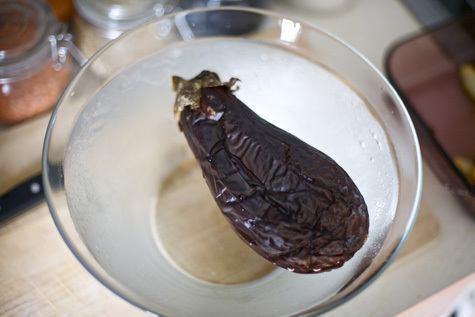 Remove the eggplant and immediately submerge it in ice water. When it has cooled the skin will easily peel off. Discard the skin and place the eggplant innards in your food processor (or blender). Add the onions, lemon juice, tahini, olive oil, and garlic cloves, then blend until creamy smooth. Add a bit of liquid smoke, salt, and pepper, then re-blend before tasting. Continue adding seasoning and smokiness a little at a time until you reach your preferred flavor balance. Serve chilled. 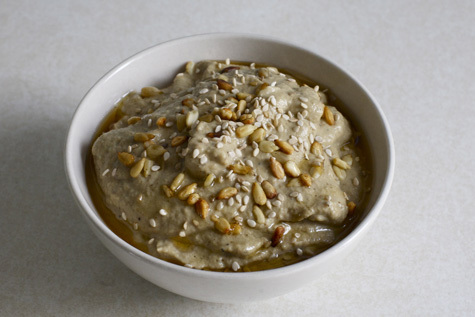 I like my baba ganoush sprinkled with raw sesame and roasted sunflower seeds, and drizzled with a bit of toasted sesame oil. This is a great all-purpose dip for any manner of veggie, and is exceptionally divine smeared on homemade flatbread. Mmmm so simple & tasty sounding! Now I really can’t wait for eggplant season. I just made baba this weekend. I love to smoke it on the grill instead of using liquid smoke. My question for you is, why peel it? The purple skin is full of vitamins and antioxidants and such. It doesn’t make it chunky either so long as you hit it in the food processor. i loooove eggplant. i love to cut it in chunks, stick it on a pan with other veggies (like zucchini), drizzle with olive oil, and put it in the oven for a while. roasted vegetables are my favourite! in greece we call this melitzanosalata – almost as good as tsatsiki in my mind. aaaaalmost. 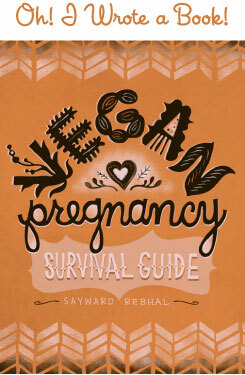 I’m with you Sayward, it’s really the one veggie I can’t stand – and it’s so often the vegetarian option on menus, or what non-vegs make when I’m invited over for dinner. 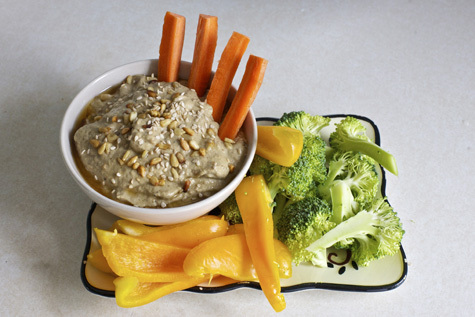 I’ll eat eggplant when I have to, but Baba Ganoush is the only way I actually enjoy it! I’ve never tried it with the onions though, will give it a go next time there’s an eggplant hanging around our place (which is not often, I must admit). I’m making this tonight! I love anything Middle Eastern. Falafel is another awesome vegan dish, and of course Tabouli and Hummus! I lived in the Middle East for a couple of years when I was younger and it was the best food of my life! Thanks for the recipe! @ Shango – Good call, next time I’ll try leaving the skin on. Thanks for the tip! @ The Selfish Vegan – Oh you must try it! Made this a few hours ago.. Two thumbs up! @ Ashley Ladd – Ooh, two thumbs up is awesome! =D So glad you liked it! I just bought everything to make this tomorrow. Canʻt wait as I am an eggplant fiend. However…………I will not go near mushrooms…YUCKY!!!!! I always find that mushrooms dishes seem to be the norm at restaurants as the veggie option. I guess that is why I only eat at home!! Will let you know the results as my hubby is the eggplant grinch……I have never tried Liquid Smoke before, I assume to proceed with caution???? Yuuuum! Thank you for sharing this! I used it on a really yummy vegan focaccia *which looked more like a ciabatta to me*. I sliced up some roma tomatoes, coated them in a bit of olive oil, basil, and oregano. Topped my baba focaccia w/the tomato yumminess. Threw it all in the oven at 350 for 9 minutes. Perfection!! Just finished making this!!! Itʻs awesome!!! Thanks for the great recipe!!! To Nicole- That sounds yummy… I will try that for lunch today!!! @ Nicole – WANT! That sounds *so* good. Oh please don’t discard the lovely purple skin; it tastes great by itself or can be blended in along with the rest of the ingredients.